b. February 3, 1889, Copenhagen, Denmark. d. March 20, 1968, Copenhagen, Denmark. Carl Theodor Dreyer’s nebulous and personally haunting childhood history began under the unassuming Danish registry name of Karl Nielsen, the infant son of an unmarried Swedish housekeeper named Josefine Bernhardine Nilsson whose placement in a Copenhagen private residence was curiously arranged by her employer, Carlsro landowner and horsebreeder Jens Christian Torp, in the days before the baby’s birth. 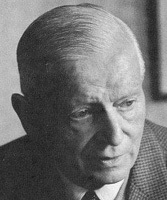 The infant Nielsen would pass through two foster homes before being placed, at the age of nearly two, into the care of a Danish Lutheran typographer named Carl Theodor Dreyer and his wife, Inger Marie, and the child was subsequently given the adoptive father’s name, Carl Theodor Dreyer. However, before the private adoption could be finalized, Nilsson, again carrying a child out of wedlock, consumed an accidentally fatal dose of phosphorous in the misguided belief of inducing a miscarriage. Consequently, the Dreyers were never properly compensated by Nilsson, as had been agreed upon, for adopting young Karl. Although it is uncertain when Dreyer discovered the circumstances surrounding his parentage, it is evident that the revelation had left an indelible mark on the gentle, intensely humble, and venerable filmmaker—a deep wound that Dreyer harbored privately, even as he summarily dismissed his childhood influences and parental estrangement in public appearances and interviews. An academically gifted student, Dreyer left home in 1906 after successfully completing his basic school course, dissociated himself from his adoptive family, and embarked on a series of unfulfilling office jobs before discovering his penchant and innate talent for journalism. He worked as a reporter for several influential newspapers including Berlingske Tindende (the oldest newspaper in Denmark) and Politiken (the second oldest), before joining, at the age of 21, a group of young and idealistic reporters in launching what proved to be a short-lived newspaper called Riget in 1910. Dreyer’s adventurous spirit placed him at the forefront of the nascent aviation society, where his fascinating and technically comprehensive articles led to his fated association with the Nordisk Film Company, serving as a hot-air balloon technical adviser. With the collapse of Riget, Dreyer found a job at Ekstra Bladet, the tabloid newspaper arm of Politiken, where his increased interaction with the fledgling Danish motion picture industry led to occasional commissions at titling and writing film scripts for several studios before signing an exclusive contract with Nordisk in 1913. Two years later, Dreyer became a full-time Nordisk employee, where his responsibilities broadened to include film editing (for which he demonstrated considerable skill) and, with the encouragement and tutelage of Nordisk technical director, Wilhelm Stæhr, Dreyer turned his attention to directing. For his first film, Dreyer decided to film a banal melodrama that was selected more for logistical expediency than narrative merit entitled The President (1918). Rather than casting the studio actors employed by Nordisk, Dreyer followed his own artistic intuition and elected to assemble his own cast of professional and non-professional actors selected for their appropriate face types to the situational and psychological profile of the characters that they portray. From the onset, Dreyer dispensed with the artificiality of cosmetics and ornately decorated sets in order to achieve a naturalness and realism to his films. The untimely death of his birth mother, Josephine, and the emotional distance of his adoptive mother, Inger Marie, would invariably manifest in Dreyer’s highly idealized (and idealistic) characterization of the inexorably virtuous, self-sacrificing, and oppressed woman. 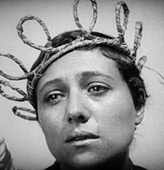 Even before The Passion of Joan of Arc (1927) would irrevocably, and misdirectedly, categorize Dreyer as a director of cerebral, religious-themed art cinema, his early films already reflected his concern for the social status of women: Dame Margarete’s (Hildur Carlberg) graceful acceptance of the unalterable cycle of life in the poignant social comedy, The Parson’s Widow (1921), Siri’s (Clara Pontoppidan) tragic response to an unwelcomed seduction in the Finnish Revolution episode of Leaves from Satan’s Book (1919), Ida Frandsen’s (Astrid Holm) enabling, defensive rationalization of her husband’s tyrannical behavior in the commercially successful domestic satire Master of the House (1925). However, despite the decidedly masculine titular reference of Master of the House, (2) it is the abusive husband Viktor’s (Johannes Meyer) process of humbling and enlightenment at the influence of the three women in his life—his wife, Ida, his governess, Mads (Mathilde Nielsen), and his adolescent daughter, Karen (Karin Nellemose)—that provides the drama and humor for the film. The President, although presented from the point of view of a male protagonist, centers on the plight of the illegitimate daughter Victorine. In fact, Dreyer’s compassion and innate concern for the suffering and repression of women would continue throughout his career: the oppressive inquisition of Joan in The Passion of Joan of Arc, Anne’s emotionally devoid marriage in Day of Wrath (1943), and Gertrud’s elusive search for ideal love in Gertrud (1964). Perhaps the most representative of Dreyer’s feminine ideal, however, is not the inexhaustible conviction and impractical idealism of Joan or Gertrud, but Inger’s (Birgitte Federspiel) role in the Borgen household in Ordet (1954)—maternal, yet sensual; spiritual, yet practical; unshakable personal conviction, yet conciliatory and tolerant. Her pragmatism, spirituality, and warmth serves as the unifying force for the family, reconciling the ideological and emotional division among her morally good, but agnostic husband Mikkel (Emil Hass Christensen), Mikkel’s brother Johannes (Preben Lerdorff Rye), a theology student who has suffered a mental breakdown and believes that he is Jesus Christ, her stern and religious father-in-law, Morten (Henrik Malberg) who is disheartened by his sons’ eroding and misdirected faith, and Morten’s youngest son Anders (Cay Kristiansen) whose love for the daughter of a fundamentalist family has strained his relationship with his father. Inspired by the artistry and epic scope of D. W. Griffith’s The Birth of a Nation (1915) and Intolerance (1916), Dreyer embarked on the large-scale production of Leaves from Satan’s Book, a film adapted from The Sorrows of Satan by Marie Corelli. Similar in structure and thematic presentation to Intolerance, the film chronicles the destructive consequences of temptation on four historical events: the Crucifixion of Jesus Christ, the Spanish Inquisition, the French Revolution, and the Russo-Finnish War (an installment conceived by Dreyer that did not exist in the original Corelli book). Dissatisfied with the compromised (3) end result of the critically unpopular Crucifixion episode, Dreyer, the consummate perfectionist, became consumed with the idea of re-shooting the life of Jesus of Nazareth in what would come to be known as Dreyer’s obsession with the unrealized “Jesus film”. It is important to note that despite the provocative and religious inference of the title, Leaves from Satan’s Book is essentially a historical film that seeks to identify and present humanist concerns. 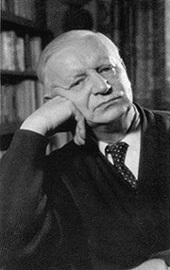 Dreyer’s interest in creating historical adaptations, undoubtedly a consequence of his former career as a journalist, would perpetuate his reputation as a religious filmmaker when, after the popularity of Master of the House in France, the Société Général de Films approached Dreyer to make a historical drama, and Joan of Arc was selected over the other worthy subjects of Catherine de Medici and Marie Antoinette (who, like Jesus, was a prior character from Leaves from Satan’s Book). As in his earlier films, Dreyer’s primary interest was in capturing the indefinable essence of human suffering. 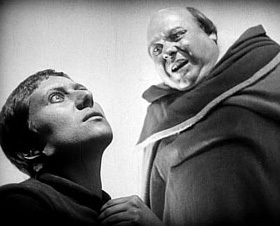 In addition to the inherently religious and spiritually transcendent depiction of Joan’s (Renée Marie Falconetti) tragic and uncompromising ultimate sacrifice, Dreyer’s humanist sentiment also transforms The Passion of Joan of Arc into a socially relevant and harrowing reflection of the senseless persecution of women in a patriarchal society. Moreover, by distilling the scope of the film to the trial process, Joan’s oppressive environment and inescapable fate become acutely palpable. By concentrating on the physical toll of Joan’s psychological ordeal, Dreyer translates the unattainable and resolute piety of Joan the saint into the accessible language of compassion for the pain and suffering of Joan the human, achieving a coexistent and symbiotic relationship between the metaphysical and the corporeal that Dreyer defines as realized mysticism. On a similar observation, if Ordet is solely defined as a testament on the absoluteness of faith, then how does one reconcile the inherent carnality in the depiction of the marital interaction between the agnostic Mikkel and the faithful Inger? 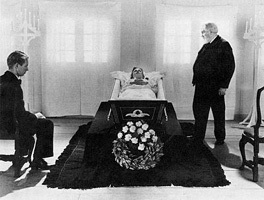 A departure from the profoundly religious subtext of the Kaj Munk play from which the film is based, Dreyer’s adaptation of Ordet is tactile and sensual (especially evident in the intimate, extended sequence of Inger’s childbirth), a reflection of his practical concerns for the nature of human existence. By identifying with the nurturing, pragmatic Inger instead of the devout, but fragmented Johannes, Dreyer illustrates the need for balance and personal reconciliation between the body and the soul. In essence, Dreyer seeks to endow the spiritual (Jesus of Nazareth, Joan of Arc, Inger Borgen) with a texturality and voluptuousness that is often only associated with the corporeal. In dispelling Dreyer’s reputation as a director of religious films, the strangely atmospheric and ethereal landscape of Vampyr (1931) may be viewed not as a radical departure to his spiritual canon, but as a reflection of his propensity for experimentation. Influenced in part by the surrealist art movement pervasive in France at the time of his residence, and also by a deliberate compulsion to escape the stigma of being referred to as a “saint’s director”, (4) Dreyer sought to make Vampyr an antithesis of The Passion of Joan of Arc: distanced, voluminous, dispassionate, and unemotive. Nevertheless, despite Dreyer’s flourishing creativity and artistic achievement abroad, Vampyr was a commercial failure and led to the dissolution of his short-lived, Paris-based production company, Film Production-Carl Dreyer. The episode marked a period of disillusionment and personal crisis for Dreyer that culminated in his nervous breakdown. Dreyer would not return to filmmaking until the early 1940s with the short film, Good Mothers (1942), before working on a film adaptation of the Hans Wiers-Jenssen play, Anne Pedersdotter, entitled Day of Wrath that explores issues of repression, religious hypocrisy, and fanaticism. During a radio interview for New Perspectives on the Arts and Science on October 23, 1950, Dreyer addressed the criticism against the seeming paradox of his meticulous adherence to realism and his use of creative inaccuracies to sustain the claustrophobic anxiety of The Passion of Joan of Arc, proposing that “there must be harmony between the genuineness of feelings and the genuineness of things.” (5) In defining the role of cinema, not as a medium for capturing absolute reality, but as a means of articulating perceived reality, Dreyer not only reconciles the strange surreality of Vampyr as Allan Grey’s (Julian West) subconscious truth, but also accepts Anne’s potential for invoking the supernatural in Day of Wrath, the existence of miracles in Ordet, and Gertrud’s (Nina Pens Rode) physical and spiritual retreat into an unrealizable, operatically grandiose emotional ideal (perhaps a reflection of her former career as a soprano) in Gertrud, as valid and natural phenomena within the context of the characters’ psychological reality. In short, Dreyer does not seek to document reality, but to capture the ephemeral essence of its underlying truth. On February 27, 1952, Dreyer was issued a highly coveted, merit-based management license to operate the prestigious Dagmar Theater in Copenhagen. With the privilege of financial independence away from the commercial aspects of filmmaking, the patient and assiduous Dreyer would continue to develop ideas through the 1960s that further reflected his preoccupation with the complex role and status of women, including William Faulkner’s As I Lay Dying, Eugene O’Neill’s Mourning Becomes Electra, and a film adaptation of the Euripedes play, Medea, subsequently developed by Dreyer admirer Lars von Trier for Danish television in 1987. However, Dreyer’s uncompromising artistic integrity would result in the realization of only two more feature films, Ordet and Gertrud, in this last period. In early 1968, Dreyer, already in ill health and recuperating from a broken hip, contracted pneumonia. He died on the morning of March 20, 1968 and was laid to rest in Frederiksberg Cemetery. Drum, Jean and Dale D., My Only Great Passion: The Life and Films of Carl Theodor Dreyer (Lanham: Scarecrow Press, 2000). Carney, Ray, Speaking the Language of Desire: The Films of Carl Dreyer (Cambridge: Cambridge University Press, 1989). Bordwell, David, The Films of Carl Theodor Dreyer (Berkeley: University of California Press, 1995). Skoller, Donald, Dreyer in Double Reflection: Translation of Carl Th. Dreyer’s writings About the Film (Om Filmen) (New York: Da Capo Press, 1973). Schrader, Paul, Transcendental Style in Film: Ozu, Bresson, Dreyer (New York: Da Capo Press, 1988). A dedicated site containing news, resources, links and more. Acquarello’s Strictly Film School page with essays on The Parson’s Widow, Master of the House, The Passion of Joan of Arc, Day of Wrath, Ordet and Gertrud. Excerpts from an interview by Michael Delhaye on Dreyer’s approach to editing. Gary Morris reviews the video release of Day of Wrath, Ordet and Gertrud at the Bright Lights film journal. The 1999 Dreyer retrospective at Film Forum in New York City. Review of the Criterion DVD box-set. Overview of the Criterion DVD releases by Doug Cummings. Biography on Dreyer with some nice pictures. Review, synopses and evaluation of the DVD box-set. Annotations on Dreyer films screened at the Pacific Cinémathèque in Vancouver. Brief introduction to Dreyer on Denmark’s Ministry of Foreign Affairs site. Criterion page on the DVD release also features an essay by Dreyer entitled “Realised Mysticism”. DVD review by Gary Morris. The lowdown on the original version of this film. David Hart’s notes on this film which screened as part of his teachings at Adelaide University. Excerpts and selected passages from Ray Carney’s Speaking the Language of Desire: The Films of Carl Dreyer. Insightful impressions by Darren Hughes on the Long Pauses website. David Bordwell’s analysis from the book Film Art. Criterion page on the DVD release also features an essay by Jonathan Rosenbaum. Criterion page on the DVD release also features an essay by Phillip Lopate. Criterion’s informative page on Torben Skjødt Jensen’s 1995 documentary. Also featured are essays by Dreyer and Ulrich Breuning. Martin Drouzy presents his theory for Dreyer’s biological father as Josefine Nilsson’s employer, Jens Christian Torp, in Carl Th. Dreyer, født Nilsson (Copenhagen: Gyldendal, 1982). Although Master of the House is the title commonly used for the film in the US, the literal translation of Du Skal Ære Din Hustru is Thou Shalt Honor Thy Wife. Dreyer expressed his reluctant use of a conventional representation of Jesus in lieu of his own artistic ideas of depicting a “large and realistic” Christ figure as a rebuttal to criticism from Kristeligt Dagblad, a weekly publication that reflected the opinions of the Danish State Church, which had objected to his use of an actor to portray Jesus. Jean Drum and Dale D. Drum, My Only Great Passion: The Life and Films of Carl Theodor Dreyer (Lanham: Scarecrow Press, 2000), p. 151. Donald Skoller, Dreyer in Double Reflection: Translation of Carl Th. Dreyer’s writings About the Film (Om Filmen) (New York: Da Capo Press, 1973), p. 143. Acquarello is a NASA Design Engineer and author of the Strictly Film School website.